1. Shred the cabbage and grate the carrots. Place in a bowl and stir in the yogurt and the juice of the lemon. Stir well to combine, season and place in a serving bowl, cover and chill until required. 2. Place the lamb mince in a large bowl and add the onion, cayenne pepper, cumin, coriander and some seasoning. Mix ingredients together with a fork then form into 8 chubby sausages using your hands. 3. Thread onto pre-soaked wooden or metal skewers. Preheat the grill to high then grill koftas for 10 minutes, turning frequently to cook evenly. 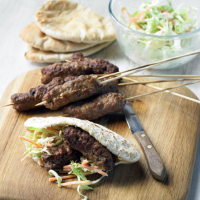 Warm the pitta bread and serve kofta in them with the coleslaw. This recipe was first published in Wed Jun 01 14:35:00 BST 2011.